Air racing remains a hugely popular attraction in America, but its heyday in Britain was in the years that bracketed World War 2. Small wonder, then, that in the late 1940s a number of famous fighter aircraft took to the skies wearing the liveries of racing stables rather than warpaint – and among them was a particularly celebrated veteran. In July 1944 the 14,533rd and last Hawker Hurricane fighter was completed on the production line at Langley in Buckinghamshire. In celebration of the fighter’s role in the vanguard of the Battle of Britain and in celebration of ‘the Few’ who fought it, the Hurricane Mk.IIc serial number PZ865 was given the inscription ‘The Last of the Many’. She was given a ceremonial role, being given her test flight by Hawker’s pre-war test pilot, Group Captain P.W.S. ‘George’ Bulman, who had been the first man to fly the prototype of the breed 10 years earlier, and then went on to fund-raising duties for the duration of the war. Soon after the end of hostilities, Hawker bought PZ865 back from the War Office and tucked her away in a corner of the Langley works as the world got on with readjusting to peace. In 1948 it was decided that PZ865 should be overhauled and flown again, but soon the government decided to place a ban on civilian operation of military aircraft, lest the skies become crowded with high performance, high maintenance machinery. 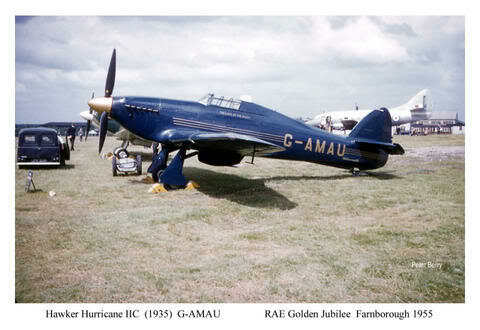 An official role was found for the Hurricane as a ‘public relations vehicle’ and with her paperwork duly shuffled, and her 20mm cannon replaced with extra fuel tanks, she was granted the civilian registration G-AMAU and repainted with a livery of royal blue and gold. It was decided that one of the Hurricane’s PR duties should be as an entry in the revived King’s Cup Air Race of 1950. The race was a handicapped event of three laps around a 186-mile ‘course’ that was open to aircraft with more than 110hp, and it so happened that an entry was being sought for Princess Margaret, the younger daughter of King George VI. The young princess was patron of the event and it was expected that someone should fly in her name. The Hurricane was deemed an appropriate ‘fit’ for the role, and the job of flying her was given to Group Captain Peter Townsend, the king’s equerry, who was a celebrated Hurricane ‘ace’ in the war. In the end Townsend and the Hurricane thundered across the finish in second place behind a humble Miles Hawk training aircraft – the handicappers doing their job well – but the blue and gold fighter had a greater significance than that. It was to be one of the most public collaborations between the beautiful young princess and the charismatic fighter pilot which threatened a constitutional crisis when their enduring love affair became public knowledge. Hawker refitted the Hurricane in readiness for another crack at the King’s Cup in 1951, including the removal of her radio, mast and other extraneous items but the death of George VI put the race into hiatus. Instead she enjoyed many and various PR roles, appearing at the Vintage Aircraft Rally in 1952, the another Royal Aeronautical Society Garden Party in 1953, the National Air Races in 1954 Royal Aircraft Establishment Jubilee in 1955. Aside from official duties, she also remained a workhorse for Hawker, acting as chase plane for the Hawker Kestrel, which was later developed into the Harrier. Public interest in wartime history began to increase through the 1960s, prompting Hawker to restore the Hurricane to perform at the growing number of air shows each year. Then she was repainted again as a Hurricane Mk.I to join the other two airworthy Hurricanes in the world on the strength of the all-star movie Battle of Britain. In March 1972, after a complete overhaul, the Hurricane regained her original serial PZ865 and was flown to RAF Coltishall where she was presented by the Hawker Siddeley Group to the Battle of Britain Memorial Flight. For the past 41 years she has been a mainstay of this, the official tribute to RAF aircrew in World War 2, entertaining millions each year among a fleet including a Lancaster bomber, fleet of Spitfires and a second Hurricane Mk.II. Out of all these astonishing and charismatic aircraft, PZ865 alone has enjoyed a unique and unbroken place in the public eye. Long may she continue to do so. Whenever you look at those pictures of young Battle of Britain pilots stretched out in the sun during the summer of 1940, with their Spitfires and Hurricanes being refueled and rearmed in the background, do you ever wonder what they’re talking about? In his brilliant novel Piece of Cake, Derek Robinson chose to portray the ‘Few’ as human beings: short on life experience, bolshy and often amusing whether intentional or not. After all, while their deeds in the air were brave and their sacrifices were great, we are talking about a lot of 21-year-old boys who have been given the fastest aeroplanes in the world to play with.